It’s still hot and sunny in London, which makes me want to do better things that wash and deep-condition my hair, so I just re-did by style from last week. 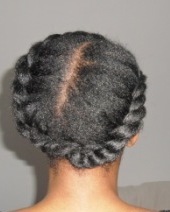 I undid each of flat-twist, re-moisturised, sealed, then re-flat-twisted. My hair wasn’t dirty, just dry so I felt ok about that. This style is slightly different from last week’s in that there are now three sections. Instead of everything in the middle the flat twists on the left and right were twisted down the length of my head and one jumbo twist was set in the middle.